At Trailer Parts Direct we sell lots of high quality drawer runners or drawer slides that are typically used to give campers easy access to their portable fridges. A fridge slide is an essential piece of gear, particularly when you need to retrieve food from your fridge frequently throughout the day. You can use these drawer runners or drawer slides for other heavy items that you want to pull out and access, easily sliding them back for storage or to increase your workable space. Items such as tool boxes, food or gear storage bins are usually installed using some type of drawer slides. They make the life of a camper so much easier! 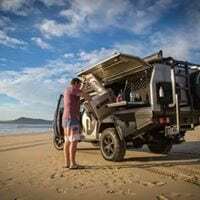 So let’s take a look at some of the features that may influence the type of fridge you buy for your next trip around Australia. Make sure that the fridge has the right type of 12 volt connector for your vehicle. Most portable fridges come with a plug that fits the accessory socket in your vehicle, but that’s not good enough for the needs of your fridge. Instead install an Anderson compatible plug and socket, as it’s rated for 50 amps, as well as 600 volts. Investigate the amount of amps the fridge will draw down, as the higher the amps, the more it will draw on your battery. As far as a battery is concerned, you don’t want to run your fridge off your engine’s battery, so install a dual battery system to deal with your fridge. Don’t forget to fit your fridge to a fridge slide and your battery to drawer runners, making them easy to access at the same time. Check that the portable fridge comes with the right type of heavy duty mounting hardware, as this makes it much easier to fit onto the fridge slide, preventing it from moving around as you drive. Does it come with a cover or is one available after-market? These covers help to keep your fridge insulated and protected, so that it doesn’t have to work so hard in hot weather, reducing its draw on your battery. Are spare parts easily available across Australia? If your fridge breaks down half way across the Nullarbor, you want it fixed as soon as you hit civilisation, so buying a fridge that can be easily fixed and with parts that can be quickly obtained is essential. Check online reviews of the company’s after sales service, before you make your decision. For more information on drawer runners, drawer slides or a fridge slide for your new purchase, call us on 1300 210 549 or send us an email.